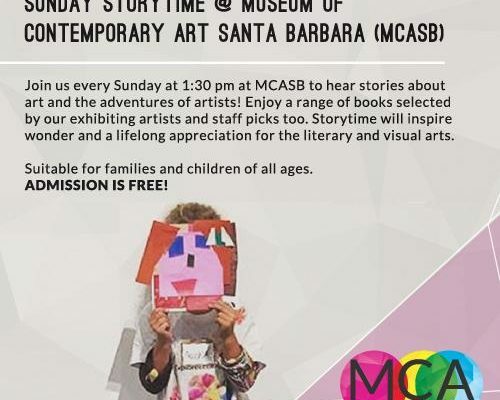 Sunday Storytime @ MCASB: Every Sunday at 1:30 pm! Join us every Sunday at 1:30 pm at MCASB to hear stories about art and the adventures of artists! Enjoy a range of books selected by our exhibiting artists and staff picks too. Storytime will inspire wonder and a lifelong appreciation for the literary and visual arts. Suitable for families and children of all ages. Register for Event: Sunday Storytime @ MCASB: Every Sunday at 1:30 pm! Your ticket for the: Sunday Storytime @ MCASB: Every Sunday at 1:30 pm!